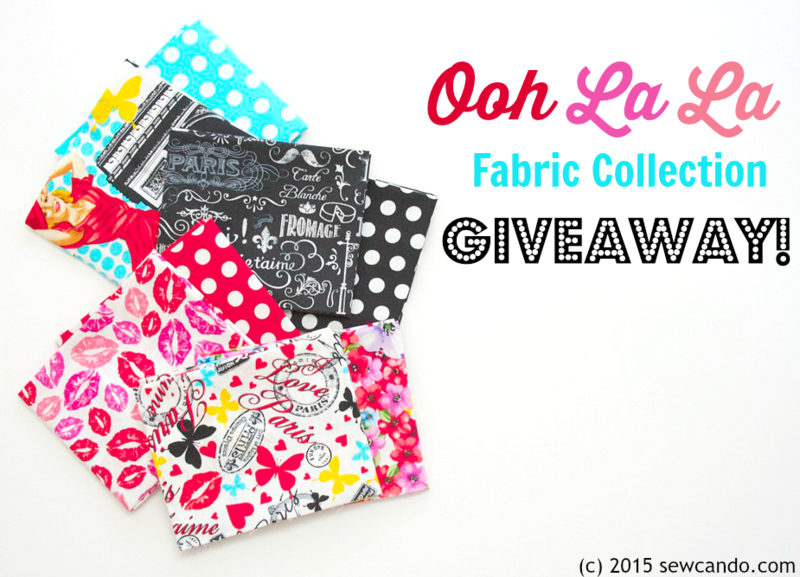 Sew Can Do: Ohh La La Fat Quarter Fabric Bundle Giveaway! 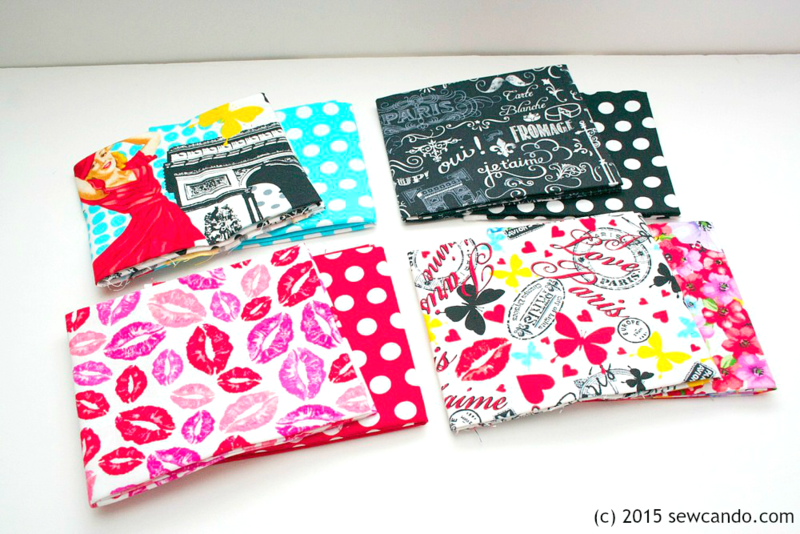 Ohh La La Fat Quarter Fabric Bundle Giveaway! Does your fabric stash need a stylish boost? Want a little fabric inspiration to jump start your next project? Then read on my fabric-loving friends, because today's post is a fabric giveaway you won't want to miss! How about a chance to WIN a fabric bundle of these chic prints for YOUR next project? 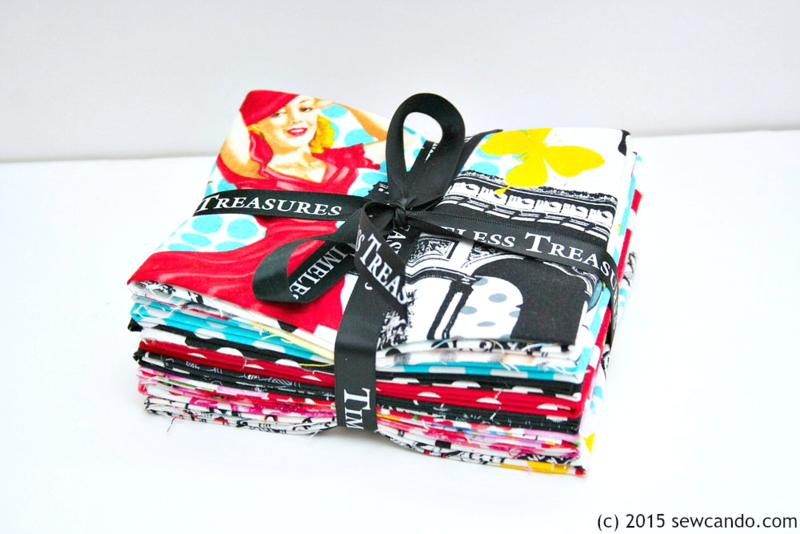 Timeless Treasures has given me an 8 piece FQ bundle of the Ohh La La collection to giveaway to a lucky Sew Can Do reader! These vibrant prints are perfect for summer. With 8 coordinating fat quarters, the project possibilities are endless! Get your entries in below - who couldn't use a little Parisian print fabric?!? I would love to make a bag just like yours! I think these fabrics would make lovely travel pouches! Thanks for the giveaway. Darling fabric. I can see an apron, a table runner (or placemats) made with those fabrics. Thanks for hosting this giveaway. The fabrics are beautiful. I loved your tutorial and might use these fabrics to make a similar bag with an accompanying cosmetic bag. I'd like to make a bag for our summer beach supplies. What fun! I would make a tote bag. Are you kidding? Those would make a great quilt to liven up any room! Thanks for sharing. I would make a quillow with these lovely fabrics. Thank you for the chance. I would make a sundress for my 3 year old granddaughter with this fabric. I would make your travel bag with this fabric! Omg those are gorgeous! Absolutely beautiful. I'll probably lost points for this...but if I won Id ship them to my quilty friend who makes the most beautiful works of art with paper piecing. It would make me feel good to gift a friend, plus it's so pretty I don't think I could do it justice like your insanely cute bag. I would LOVE these Fat quarter pieces! So fresh! Thank you for the wonderful giveaway! This is a really cute set of fabrics. I think it would make adorable aprons. Great colors & prints in this bundle, thanks! I would try my best to make a Bon Voyage travel bag just like yours if I win this bundle! Wonderful fabrics. Thanks for doing the giveaway! Thanks for having this giveaway! The fabrics are beautiful!! Thanks for the giveaway. I really like that travel bag. I need one. Yes, please pick me!!! I love the bright colors & happy vibe of this new fabric line! These are so cool!!! I would surprise my daughter and make her cushion covers for her bedroom!! I think I would use them to make some much needed organizing baskets and change purses. Can't have too many change purses or baskets! I would love to make a laptop case for my daughter! I think these would be perfect for make-up bags for teens! Thanks for the chance! I think I'd make a purse too - such fun fabric! I have been wanting to "tackle" the Amy Butler travel bag, so this fabric would be absolutely perfect for this project. Oh, I will keep my fingers crossed for this wonderful giveaway! Thanks so much. Some sort of bag. Those fabrics are so happy that I'd love to carry around something made with them. I would make a tote bag. My skills aren't advanced enough to make one like yours, which is gorgeous! Looove your duffel bag by the way!! Soooo cool! Thanks for the Turorial! I would make a handbag of some sort. A purse or tote bag! I'm actually planning on making that tote, so this fabric would be wonderful! I would love to see Paris. But a chance to win fabric is always fun. that beautiful fabrics, I like sew a table runner. My first thought is that I would love to use them in a colorful quilt! I do love your bag though -- might be tempted to make one of those! I just started quilting this year and would love to make a zipper tote out of this beautiful bright fabric. I would like to make a bag just like yours! Love your bag, great idea! Cute bag! I would love to make a modern quilt! 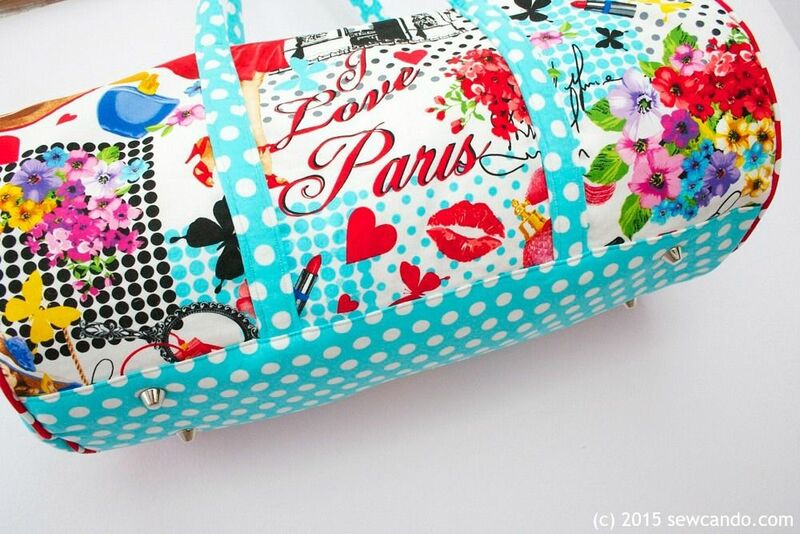 A bag for my friend that loves anything Paris! Maybe a tote or a quilt. Love your bag! These fabrics are fantastic! Love your blog & tutorials! I can see making some small zippered pouches showcasing each of the fabrics or maybe combining the fabrics for a patched messenger bag. I would make a quilted apron or quilted pillows. These fabrics are gorgeous! I would love to make my granddaughter a bag with these. Also a smaller bag for her makeup & toiletries as she likes to work out and swim at the rec center after school & in the summer. Thank you for a beautiful giveaway & the chance to win. God bless. Might make lined food bags. I would love to make a tote bag or pillow case for my kids!! I would love to make a travel bag. Lovely bag and fantastic giveaway!! Thanks a lot!! I want to make the travel duffel you blogged about and I want to buy another bundle of it for another bag called the bionic gear bag. Thank you! Thanks so much for the great giveaway. Love these fabrics to do a travel bag. Love your blog and tutorials. i would make a new little purse/bag for my little sister! she loves carrying things around with her. Either a tote or travel bag would make up great with these fabrics! I would make a bright charity quilt for a teen-aged girl. I donate to a kids' chemo unit. I love the tote bag shown in your post. I'm going to use the fabric to make a tote bag for myself and one for each of my two quilting friends. I might like to make a bag for our daughter. I would make some pillows or a hand bag. What a great bundle! Love your duffel bag! Who says we have to leave home to experience Ohh La La France! Wonderful Giveaway, Thank You! Im loving making Creative Maker Cases and these fabrics would be perfect! What a fabulous giveaway! I'm just so in love with that duffle bag. Thanks for the giveaway. Love that duffle, but these prints would make great little zip pouches / makeup bags, too.